For successful events or conferences in Japan, Grand Park Otaru, Otaru’s only international luxury hotel is the definitive venue with its choice of corporate boardroom settings, dramatic banquet rooms and functions halls framed by vast ocean views. Overlooking the stunning Ishikari Bay, this hotel is a 30-minute drive from Sapporo and a 5 minutes’ walk from Otaru Chikko Station. Travelling from the new Chitose Airport only takes about 65 minutes by train. Grand Park Otaru’s ten flexible conference and banquet rooms are designed to comfortably house any event, large or small. The spacious banquet rooms can cater to over 700 people for the perfect Hokkaido wedding or conference. The varied range of lifestyle and dining options within the hotel also provide an ideal place for after work bonding and networking sessions. Enjoy exquisite cuisine and creative cocktails at any of our restaurants and bars. The adjacent Wing Bay Otaru, one of Hokkaido’s largest shopping malls, also provides easy access to a wide range of dining, retail and entertainment options. For a lifetime of special memories of a Sapporo wedding, couples may choose to seal their nuptial vows at either the Western or Japanese-style wedding chapels. Whether the bride plans to don an elaborate Japanese traditional kimono or wear a soft, flowing bridal gown of her dreams, the awe-inspiring ocean views of Otaru’s famous Ishikari Bay will play witness to the romantic occasion. With the sky, sea and yachts as a beautiful backdrop, our outdoor terrace makes for many ideal photo opportunities. Grand Park Otaru offers distinctive Hokkaido wedding locations, reception venues and impeccable catering for flawless celebrations, from intimate to extravagant, traditional to unexpected, that are uniquely yours. When it comes to rejoicing in one of life’s biggest moments, celebrate your wedding at Grand Park Otaru. 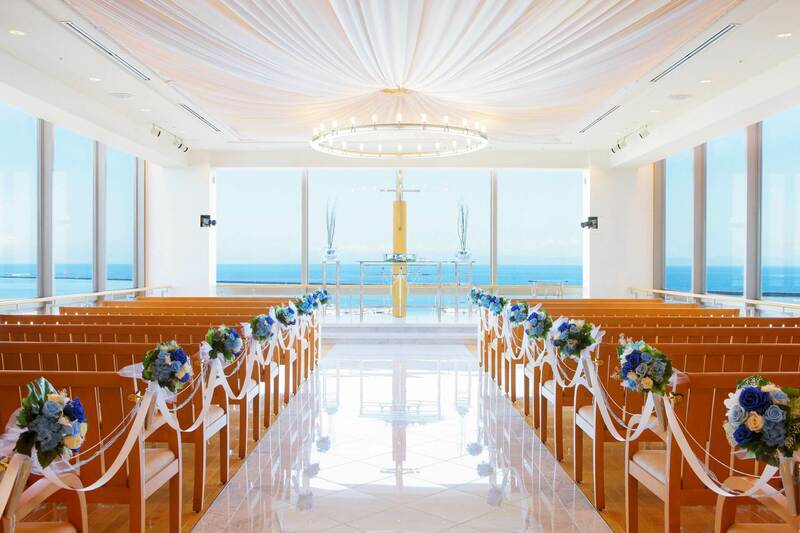 Choose to exchange your vows at the hotel’s Western or Japanese-style wedding chapels, set against the magnificent backdrop of Otaru’s famous Ishikari Bay, where clear blue skies joined by gentle lapping waves play witness to the special occasion. For western-style weddings, say “I do” to your special someone in the presence of clear skies, the vast sea and of course, your beloved family and friends. Couples who opt for a Japanese-style wedding ritual will experience the intricacies of Japanese culture, from donning an elaborate customary kimono to being blessed by Shinto priests in a traditional ceremony. Celebrating love at Grand Park Otaru comes easy and we will accord your wedding the attention it deserves. Whether it’s a joyous bridal shower, an intimate dinner or lavish banquet, let us be with you every step of the way – from setting up a unique venue, conjuring an exquisite feast to creating a lifetime of cherished memories – as you embark on a new journey with your special someone. At Grand Park Otaru, we will ensure that your special day is one to remember. Regardless of your budget and requirements, there will be a wedding package that meets all your needs. Contact our wedding team to discuss your dream wedding today. Turning events into truly unique surprises, Grand Park Otaru ensures a lifetime of cherished celebrations. Whether it is a lavish wedding, themed celebration or an intimate dinner, Grand Park Otaru enables you to celebrate your special day with understated elegance and ease. Overlooking the bay, our function spaces also offer direct access to a spacious outdoor terrace where panoramic vistas of the Marina and Otaru are sure to take your breath away. Grand Park Otaru’s reputed tradition of creating enchanting stays is also replicated in the service of the dedicated team whom will be on hand to ensure the highest quality in service and culinary experience.